About 3,500 Americans die each year in fires and about 18,300 are injured. Many of them might be alive today if they had only learned what to do if there is a fire. It is very important to have working smoke alarms with working batteries in your home. If you have that, it greatly lowers your chances of dying in a fire. In the event of a fire, properly installed and maintained smoke alarms can save your life. Smoke alarms provide early detection of a fire to allow your family time to escape safely. There are many different types of smoke alarms on the market. How do you know which one to buy? What types of alarms are out there? There are many brands of smoke alarms available for purchase, but there are two basic types: photoelectric and ionization alarms. Ionization alarms sound quickly when a flaming, fast moving fire occurs. Photoelectric alarms are quicker at sensing smoldering, smoky fires. Dual sensor smoke alarm combines ionization and photoelectric alarms in one. Hearing Impaired smoke alarms meet the needs of those with hearing disabilities. These alarms can be equipped with strobes that flash and/or vibrate. Inside and outside all sleeping areas, and on every level of the home, including the basement. Since smoke and poisonous gases rise, installing smoke alarms on the ceiling is ideal and will provide the earliest detection. How do I install smoke alarms? Interconnected Smoke Alarms provide notification throughout the home. When one alarm is activated they all sound. These type of alarms can be wired directly into the home and will need a certified electrician to install and/or maintain them. You can also purchase smoke alarms with wireless technology, which uses radio frequency to transmit and receive messages. Battery operated smoke alarms can be installed with as little as a screwdriver. Follow the manufacturer’s instructions to install properly. 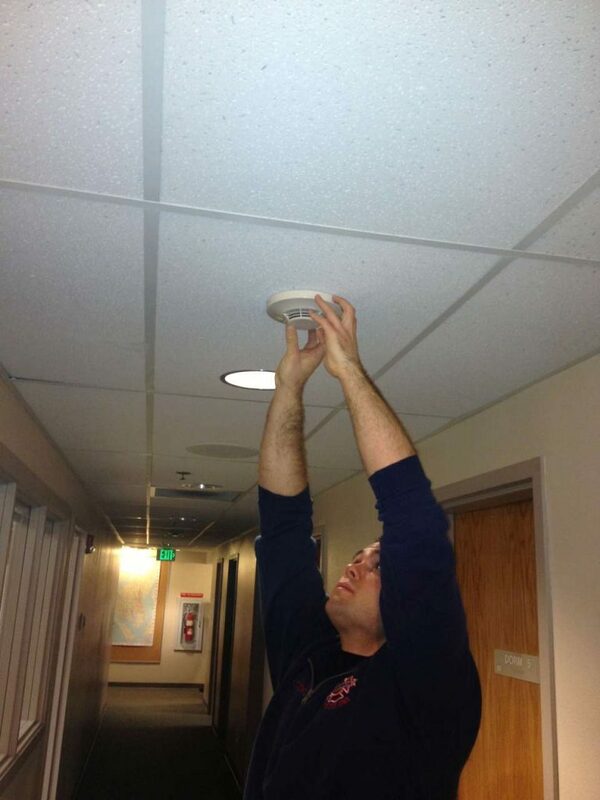 The entire smoke alarm needs to be replaced every 8-10 years. What kinds of batteries do they take? Standard 9-volt batteries. Change your battery at least once a year during the time change in the spring or fall; it is an easy way to remember when to change the battery. Lithium batteries: Designed to last as long as the smoke alarm, 8-10 years. However, you still need to test smoke alarms monthly to make sure they work. Smoke alarms that are hard wired into your home will need a battery backup. These are typically a 9-volt battery. Standard battery powered alarms can either use 9-volt batteries or long lasting batteries, all of which can be found in local hardware stores. 9-volt batteries need to be replaced once per year. Long lasting batteries are intended to be installed when the smoke alarm goes in, and the entire unit (including the battery) can be replaced after 8-10 years. No matter what kind of battery you have, they will need to be tested every month.